Workshop: HOW TO CREATE MAPS FOR EBOLA's FIRST RESPONDERS which are used by Doctors Without Borders, Red Cross, WHO and others. The workshop quickly shows how to easily use a humanitarian mapping freeware so anyone can contribute to this global mapping collaboration. Volunteer now! Join contributors world‐wide and help create the maps which are being used in the fight against Ebola. 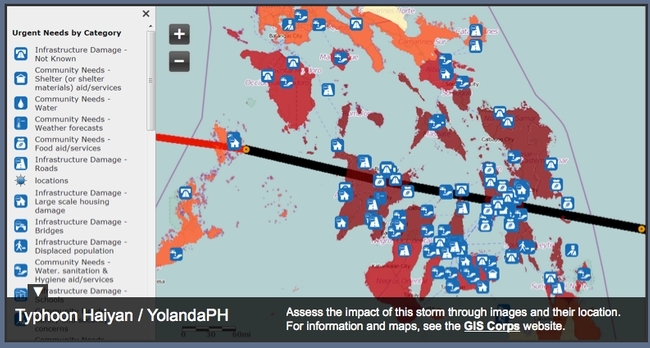 Easy to make, these maps are for first responders including the World Health Organization, Red Cross, Doctors Without Borders and others. Come and Learn how to map rooftops in cities and the paths and roadways to remote villages using Open Street Map and satellite images. First responders need your help today. And, you can share your ideas on how you can participate in this collaborative effort. Thursday, October 30th, 1:00 – 2:00 p.m.
Friday, October 31st, 10:00 – 11:00 a.m.
From Live EarthquakesWe felt the 6.1 quake here in Berkeley as a long, rolling, continual shimmy. Up in Napa it was considerably more than that. Lots of news about lost wine etc. 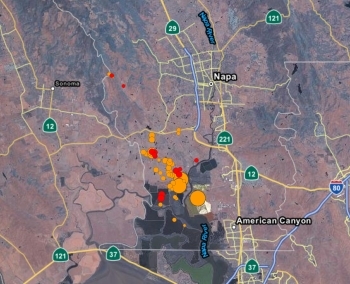 There have been a number of small aftershocks since 3am, we haven't felt them here, but Napa valley is jumping this morning. This website offers an initial description of post-fire vegetative conditions using the Rapid Assessment of Vegetation Condition after Wildfire (RAVG) process. RAVG analysis looks at fires that burn more than 1,000 acres of forested National Forest System (NFS) lands, beginning with fires that occurred in 2007. These fires result in direct losses of vegetative cover and many of the benefits associated with forested ecosystems.